rainbowJSON is a jQuery based JSON formatting and syntax Highlighting plugin to make your JSON objects & strings collapsible, colorful and more user readable. 1. 引入css文件 Include the jquery.rainbowJSON.css style sheet in the head section of the webpage. 2. 添加json数据 Wrap your JSON strings into a container. 3. 引入jquery文件和rainbow js文件 Include jQuery library and the jQuery rainbowJSON plugin at the bottom of the webpage. 4. 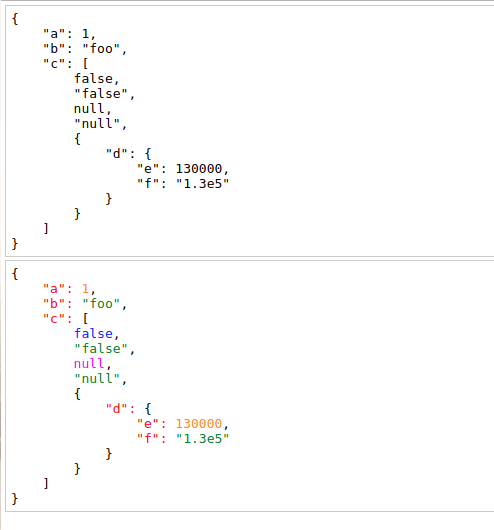 绑定 Initialize the plugin to format your JSON data. 5. 其他选项 Options and defaults.